People are increasingly used to take a look at what happens today before going to sleep. But it will be painful to keep sitting in front of computer after long-hours work, then Apple rescue you out from this embarrassment. But new problem emerged subsequently, you are forced to wait for a tedious and lengthy conversion progress to convert .wmv videos to your iPad/iPhone. Then Air Playit saves you. A lot of iPhone iPad owners are stuck when trying to put movies into iTunes to sync them onto their iPhone or iPad. Only problem is that their movies are either .avi format or .wmv format, which are not accepted by iTunes. The point is that they have to turn their avi or wmv videos to MP4, MOV for iPhone iPad support. As a video format converting device, it is undeniable that video converter software is welcomed by public for a long time and has always being dominant in the market. But managing your media for synchronization isn't fun, even at home. Wouldn't it be nicer if you could simply stream any video file like AVI,WMV, MKV etc from your Mac or PC and have it play back instantly on your iPhone or iPad anywhere and anytime? Good news, then, that there is a solid option to accomplish this handy trick. Air Playit is a free application which has the ability of streaming WMV video from your home computer to your iPhone (6s/6s Plus) iPad anywhere in the world via WiFi, 3G or 4G network. From now on, you will have access to a limitless number of movies anywhere without waiting, and they take up no space on your devices at all! Here is a tutorial guide of streaming WMV to iPhone iPad so that you don't need to use video conversion tool anymore, just watch the WMV video on your iPhone iPad directly. 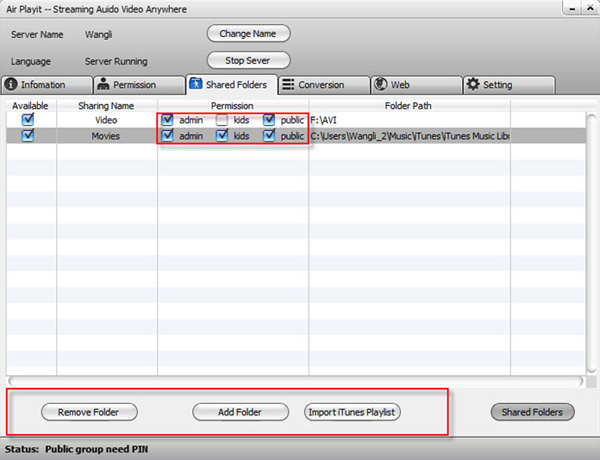 The step by step tutorial of streaming WMV to iPhone iPad. Before streaming WMV to iPhone iPad, you should download and install Air Playit Server and Air Playit Client app. Step one: Download and install the PC or Mac version according to your computer. On the main interface, it will show you the port and IP address, which may be used to specify the server address when the client app can't find the Bonjour connection information. Set access permissions as you need after well selected the video and audio to share. It includes Admin, Kids and Public. Now download and install the Air Playit Client on your iPhone (6s/6s Plus)/iPad device. Air Playit is a client app, acting as a personal video & audio cloud. Step One: Start up the Air Playit app on your iOS devices and add your server. 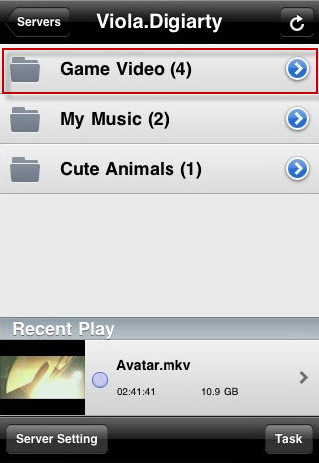 Step Two: Now select one of the folders which contain the WMV video you want to stream on the Air Playit Server. Step Three: Browse the folders under the server, after you select the WMV video you want to watch, click "Play" to watch the WMV video. Of course we know that WMV file is not supported by iPhone/iPad, but don't worry, Air Playit is capable of streaming WMV video to the iPhone/iPad friendly format on the fly automatically, no need to wait before watching. Very Cool! With 320 different built-in video/audio codecs, Air Playit support all most video & audio formats, besides streaming WMV to iPhone/iPad, you are also allowed to do streaming MKV video to iPhone/iPad, streaming AVI to iPhone/iPad, streaming MPEG to iPhone/iPad etc. It also acts as a remote video converter software which helps you download the videos to your iPhone iPad via WiFi and 3G/4G, watch the video while no streaming process needed.